Is manual data entry, invoice approval and document filing slowing down your payables process? KwikPayables Accounts Payable software automates routing, transaction data entry and status reporting for invoice and payment approvals. See how your Accounts Payable department can gain visibility into and control of AP processes – saving time and money while protecting against compliance and audit risks. KwikPayables is a business process automation solution that helps the accounts payable departments manage the out-of-control flow of purchasing-related documents, whether in paper, email or electronic format, that can introduce errors and inefficiencies into the payables process. 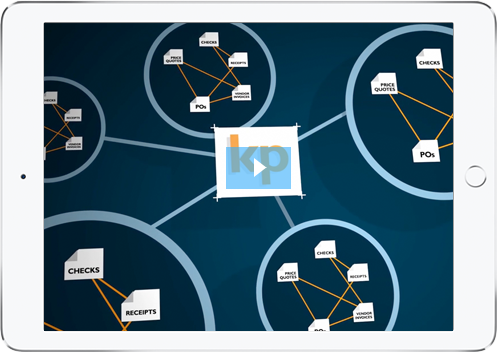 With KwikPayables, you can achieve end-to-end accounts payable automation and gain control and visibility while eliminating redundant data entry. KwikPayables cuts your invoice processing costs from $43 to less than $5. KwikPayables is the accounts payable automation solution that starts with an easy invoice indexing experience and ends with automatic transaction creation. With minimal data entry, your accounts payable department can quickly digitize and organize invoices with related documents, so they can be automatically routed for approval. Your company’s approvers can access vendor information, tax and currency data, intercompany transactions, analytical accounting dimensions as well as other details – all without being in the ERP system. Once approved, payables transactions are created in GP or SL in one click! Learn how a regional assisted living provider automates their accounts payable process as part of a complete solution that is saving the organization more than $1M per year. With 100 KwikTag users across multiple locations, CCA centralized and automated their entire accounts payable process. Accounts Payable Automation That Fits Any Industry!